One of the 'best' covers of the year if you ask me! With the bedroom as the main theme for an article in the latest vtwonen, stylist Cleo Scheulderman created four different and multifunctional bedrooms. It might be having the same black & white photos at home this room feels so comfortable to me but there is more.... what really caught my eye is the paneling behind the bed creating a cozy spot for different frames, pictures and other collections. 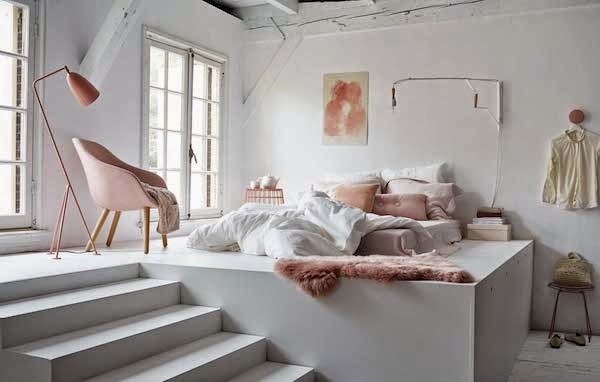 When talking with Cleo, I found out that she designed the headboard together with Dutch company Combitex whith who she works often on furniture for her styling projects. The pannel above includes a small bench, making the headboard multifunctional and creating an extra spot to sit or to have your stuff at hand. The size of the headboard is about 120cm high and 8cm deep you can make it as large as you need. The bench is made out of pine wood and painted white. What is your favourite room of these four?